With 5th anniversary of the program, this year's 20 Ambassadors will offer a unique perspective on important health IT challenges impacting quality care delivery. This year’s selection of a HIMSS Social Media Ambassador class marks the program’s fifth anniversary. Each and every year, I learn something new and powerful as the industry matures and my ambassador colleagues push me in new ways to embrace change and turn it into something meaningful. Last year’s class had a particularly profound impact on me personally for two reasons. First, collaborating with last year’s ambassadors taught me the power of empathy in making an impact on health and healthcare – namely because each person I encountered teemed with this energy of caring determination. Spoiler: It was and continues to be contagious. Second, and not unexpectedly, those ambassadors left the program better than they found it. At the onset of the HIMSS Social Media Ambassador program a year ago, they pushed me to establish a mission and vision – they encouraged me to name what this program stood for and why we all work so hard to get it off the ground year after year. What you find below is the result of that collaborative exercise. And as we look ahead to what we have in store for the industry, and what the industry has in store for us, I hope that this mission and vision will be the foundation we need to make social media a conduit for change in an industry that matters so very much to each and every one of us. I am confident that this year’s class will build upon these values to make it another unforgettable experience while challenging all of us to dig a little deeper and reach a little further to leave this industry better than when we found it. HIMSS Social Media Ambassadors are chosen for their social media savvy and unique perspectives on important health IT challenges impacting quality care delivery. Each ambassador brings a wealth of experience, knowledge and a powerful network that enables a proactive and far-reaching discussion on the issues you will see at this year’s conference and the industry at large. 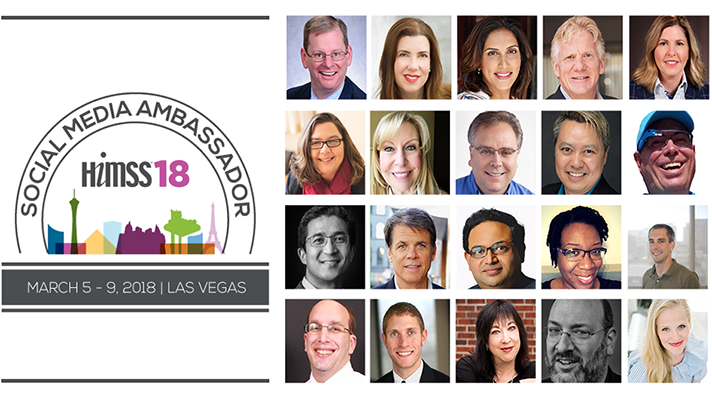 Leading up to HIMSS18, the social media ambassadors will be sharing their industry perspectives to help set the stage (both literally and figuratively) for the important discussions, via the HIMSS18 newsfeed, HIMSS LinkedIn Group discussions, Twitter chats, and more, once we all convene in Las Vegas this in March of 2018. During the show, these 20 social media aficionados will be tasked with highlighting and curating some of the best and actionable moments that capture the essence of the health IT industry as it is, how it should be, and opportunities to close the gap. After the conference, ambassadors will provide insight, lessons learned and recommendations for progress to be made in their respective areas of expertise. From beginning to end, the HIMSS Social Media Ambassadors will be a resource in equipping and inspiring the industry to move forward – proactively and with purpose. Be sure to inspire them back by following them, engaging with them via their professional social networks listed below. Subscribe to the official HIMSS18 Social Media Ambassador Twitter List and help us make social waves about health IT optimization and technology’s promise to empower a healthier society. Have some guidance on how to accelerate health innovation through information and technology? Tell us and the Ambassadors on Twitter using #HIMSS18.